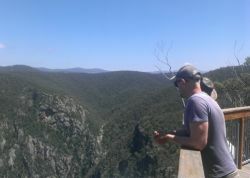 This is taken as part of ENV3GPL (15 credit points) and includes a 7 day field trip to the Snowy River and its tributaries, East Gippsland, Victoria. These workshops provide essential information about the field course. We will start developing an understanding of the landscape using GIS. Field trip costs and details: food and transport provided. Accommodation camping or in shared dorm rooms. Cost in 2017 was $352. You will also work on research projects that collect data linking plant distributions to geology, topography and fire. This subject will introduce you to the geology, geomorphology and botany of a remarkable area of eastern Victoria - the Snowy River and its tributaries. Here, rainforests, tufa terraces, eucalypt forests and rainshadow woodlands dominated by native pines are the dominant vegetation types. Their distribution is a function of the unique geology of the area - limestones, mudstones and volcanics provide the underlying rocks on which vegetation is distributed. We stay at Homeleigh, just outside of Buchan, in shared accommodation, while spending our days in the field at wonderfully named places such as Suggan Buggan, Pine Mountain and W Tree. For further information please email Dr John Morgan at J.Morgan@latrobe.edu.au.